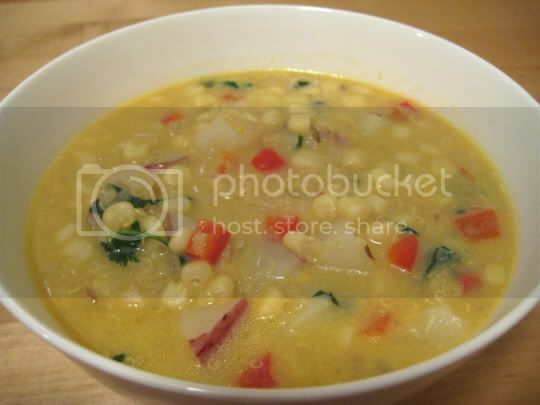 My first experience with quinoa was a good one with this delicious chowder recipe. Quinoa (see those tiny clear circle-looking things?) is a grain that I think, when cooked, takes on a texture similar to oats: chewy, hearty, filling. Pair that with a creamy yet light chowder broth (a mix of vegetable broth and soy milk), corn, potato, shallots, and bell pepper to create a healthy and satisfying meal. The corn adds a nice sweetness, although I would suggest adding salt to taste, as the chowder is surprisingly bland without it. Well, not bland but...there's just that extra "something" missing...and it turned out to be a little salt. Cilantro adds a nice fresh, pungent flavor. Make again? Yes, with the salt of course.